MIAMI, FL--(Marketwired - Apr 16, 2015) - For freight forwarding and logistics leader Panalpina, the drive to protect clients' high value shipments from container theft led to the selection of a kindred spirit in global supply chain integrity: Sealock Security Systems, Inc. headquartered in Miami, FL, USA. 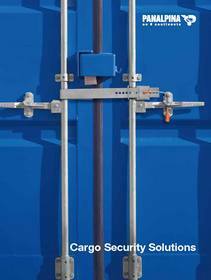 Panalpina, which utilizes Sealock's innovative tamper-evident container security products, decided to put the SU2009 hybrid lock and seal device on the cover of their new Cargo Security Solutions brochure. "As one of the simplest but best security solutions for ocean containers, the Sealock was a natural choice," explained Kevin Johnson, corporate head of security at Switzerland-based Panalpina. "These locks are among the most effective deterrents we have against ocean container break-ins, simply by making theft a more complicated, time-consuming and noisy endeavor." The product endorsement by Panalpina is the latest spotlight to shine on Sealock's history of developing industry-leading container security solutions. In the post 9/11 era, several of the company's hybrid seal and lock devices were placed on the Department of Homeland Security's Approved Products List. Last year, U.S. Customs and Border Protection's (USCBP) Custom-Trade Partnership Against Terrorism (C-TPAT) featured Sealock products in a membership bulletin to show examples of container seals that met the International Standards Organization's (ISO) new high security standards (ISO 17712:2013 w/ Clause 6). "We applaud Panalpina's comprehensive security protocols and track record of industry leadership," said Sealock Vice President Ray Fernandez. "We're honored to stand with them in providing manufacturers and shippers with advanced security strategies and container sealing technology that protects the chain of custody against theft and terrorism from end to end." For more information on Sealock products and services, call (305) 418-7603 or visit sealock.com. To view the Panalpina Cargo Security Solutions brochure, click here.